Exploring local markets is always one of my favorite things to do when I travel to new cities, so I knew that I simply couldn't miss Istanbul's Spice Bazaar. Built in the 1600s, the Spice Bazaar (Mısır Çarşısı) is also known as the "Egyptian Bazaar" because its construction was funded by the revenues of Egyptian imports. This Ottoman-era marketplace attracts a wide variety of hungry tourists and locals with its abundance of spices and fresh Turkish delicacies such as nuts, dried fruits, herbs, tea and lokum (Turkish Delight). Upon entering the crowded, bustling market, it was just as exotic and overwhelming as I expected it to be. Wide-eyed and filled with wonder, I began exploring the chaotic bazaar. I immediately felt a rush of excitement and anxiety, akin to how I felt as a child when I visited Disney Land. There was so much to do, so much to be seen, and a weird sense of pressure to fully experience it all - not missing a single stall, photo opportunity, or exotic Turkish treat. Sometimes traveling can provoke that kind of anxiety within me, as if I'm competing against myself to have the best time possible. As the crowds and stimuli of the bazaar bombarded my senses, I began to feel myself panic. I rushed to take as many pictures of dates and baklava as possible, when shortly thereafter I realized I had lost my friends. Full on panic arose. In this loud, sprawling marketplace, how would I ever find them? Heart racing and sweating profusely, I darted past the nearby vendors, desperate to try to spot them. I could see people eyeing me, but I couldn't conceal my fear. After what felt like a thousand lightyears (which in reality, was probably only about 3 minutes), I finally spotted my friend's bright red jacket in a stall across the way. Lesson learned: it's probably not a good idea to wander off to take pictures in a crowded Turkish market. I gave my friend's arm a loving squeeze, took several deep breaths, and sipped on some tea that the shop vendor offered me. Enveloped in the calm that always follows the storm, I no longer concerned myself with having the "the ultimate" experience. Potential photo opportunities and experiences aside, I needed to focus on living in the moment (while also not losing my friends again). From there on out, I surrendered my senses to the enigmatic Spice Bazaar. I admired the vividly colored spices, tasted a myriad of samples, and made friends with the affable vendors. I stocked up on cumin, cinnamon, apple tea, curry and other spice mixes to take home with me, and picked up some pistachios and rose Turkish Delight to snack on while we browsed through the other stalls. I basked in the market's vibrance. Everything we saw, every morsel we tasted, and every friendly merchant we talked to enriched our experience. I was filled with that childlike wonder again, minus the anxiety that I had originally felt upon entering the market. When I freed myself from the pressure of having to experience as much as possible, I managed to do just that. I left the Spice Bazaar with full shopping bags, a full belly, and a full heart. While this captivating marketplace was one of my favorite places in Istanbul, it also challenged me in an unexpected way. My experience in the Spice Bazaar taught me that instead of actively seeking out experiences, sometimes you just have to let them happen. Open daily from 8:00 am to 7:30 pm. Closed on Sundays, October 29th and religious holidays. 51 comments on "Istanbul's Spice Bazaar: A Feast for the Senses"
This post is spectacular, Courtney...what a feast for the eyes. Pinned for future reference. Thank you! That's the kind of bazaar that I was longing to see in Turkey, but didn't get a chance. Great! Gorgeous photos! I'm sure that would have been overwhelming -- especially losing your friends! This market looks amaaaazing-- I'm glad you stocked up! Especially that rose turkish delight... I haven't quite seen anything like that before. I can only imagine how fantastic that place smelled! It looks so exotic. Such incredible colors! 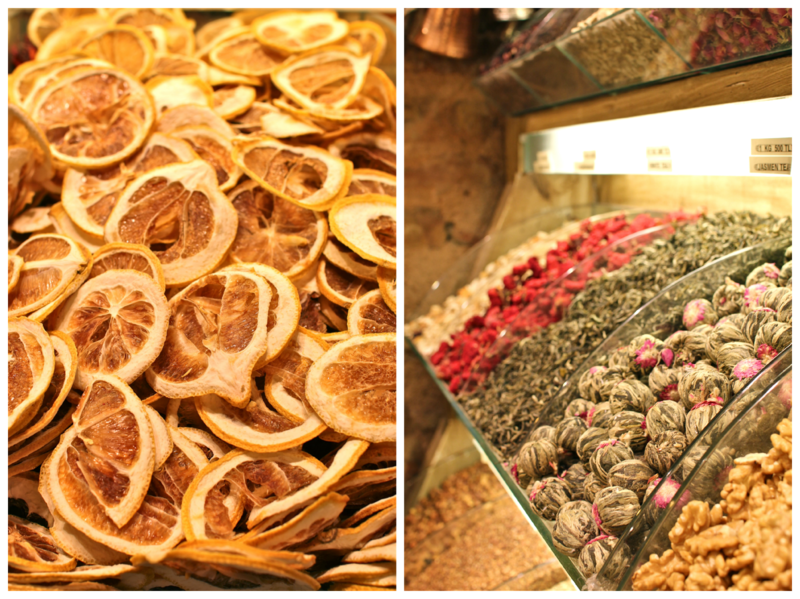 We loved the Spice Markets in Marakech too... so fragrant and delicious! I'd have ended up separated from my travel companions the same as you since I'd be so busy documenting and experiencing it all, especially in Instanbul! Um WOW my mouth is watering! I want to visit Istanbul SO badly and when I do, this is on my to-do list! Yum! Your pictures make everything look DELICIOUS. I’m a big fan of the nuts + dates combo, so I would be in hog heaven there. Ahh, I want to go to Istanbul so badly!!! And even more after seeing this post! When I was in Marrakesh in the souks, another couple likened the experience to this market in Istanbul. I loved spice shopping (and carpet shopping) in Morocco so I know I would love to experience this one day! You're such a good photographer! These are gorgeous. I love markets, and I can just imagine how fragrant and colorful a spice market is. I'm drooling over here, your photos make me feel like I'm there! What was the best thing you ate/tried while at the market? I am beyond obsessed with market pictures because of the bright colors and goodness offered... and these are amazing!! I can't imagine how many different smells must have been competing for your attention though!! I remember walking through the Spice Bazaar too. We found ourselves there with no idea of what it was (I actually thought it was just a random market). I remember how crowded it was and all the different smells! Then we realized it was actually a famous place, and went back to experience it properly. I know what you mean about feeling like you need to capture every single moment. Sometimes, I need to remind myself to calm down and not ruin an experience with the need to take a million photos. It's exactly the kind of place I expected to see in Turkey, but it still managed to exceed all of my expectations! Yeah! Sensory overdrive is a good way to describe it! How cool that you have a shop like that nearby! I bet it really does smell incredible! Thank you! And it definitely was... lesson learned!!! The rose flavor was incredible! But the pomegranate + pistachio combo was insanely delicious too. I didn't think I liked Turkish Delight before going to Istanbul, because every piece I had tried in Spain was kinda gross. But the real deal is undoubtedly delicious and addicting! So many delicious scents and flavors! Exotic is definitely the perfect word to describe it. I wish I had explored the spice markets in Marrakech! I explored the Souks quite a bit when I was there, but I found it to be even more of an overwhelming experience. I bet you brought home so many delicious spices though!! Exactly - everything was the perfect photo opportunity! (Minus the really crappy lighting inside of the market...) After losing them, I made sure to drag them with me every time I wanted to wander off! That's actually really interesting! I would have never known that, so thanks for pointing that out! And if you like dates and nuts, you'd seriously love this place. It took some real self-restraint to not buy EVERYTHING! I found this market to be relatively similar to the souks in Marrakech, but a lot less stressful of an experience! The Turkish vendors were a lot less pushy and a whole lot friendlier. (At least in my personal experience, obviously I can't speak for all of Turkey or Morocco.) I seriously wish I had brought home spices from Morocco though! Definitely missed the memo on that one! Thank you so much Andrea! It was certainly a unique place compared to the other markets I've been to! SAME!! It was such a struggle to not buy everything. If I had brought a bigger suitcase to Turkey with me, I probably would have done some serious damage. I definitely overindulged on some seriously delicious rose and pomegranate + pistachio Turkish Delight, and all of the roasted pistachios I tried were really good too. I also tried this really tasty meat/fish seasoning that I brought home for my mom - I have no idea what it was made of, but it was the perfect combination of salty and savory! Merci!! That's too bad you couldn't spend more time there, but there's always next time, right?? I'm glad I'm not the only one! I really need to keep myself in check when it comes to that! Sometimes it's just so hard though. Oh, good to know! I did find some of the vendors pushy in Morocco, and I'm also not used to bargaining so that felt uncomfortable as I tried to get the hang of it. This is right up my alley Courtney! And I love all of these photos! I'm dying to travel to Istanbul! Sounds like you had lots of great eats, I'll keep them in mind for when I finally get to Turkey! Thanks Yalanda! It's such a fascinating place - I can't recommend it enough!! I'm glad I'm not the only one who has that problem, haha. Non-bloggers just don't understand!!! (Can I start calling them "blogging muggles", or is that too mean?) I'm happy my post could take you back to beautiful Istanbul for a day :) Here's to going back there someday soon!!! Oh you are wicked :-). Your pictures make me want to go back to Istanbul. Blood sugar be damned, l ate pistachio Turkish delight. Everything was delicious. Your images are fantastic!!! Ahhhh my mouth is watering just looking at these photos! Outdoor markets are the best. If only blog posts had smell-o-vision so I smell the spices... Mmmm. Great photos as always! Thank you! I'm sure the pistachio Turkish Delight was worth indulging :) I couldn't get enough of it!! wow those colours are so vibrant!! I would really get overwhelmed in a bazaar like this - so much to smell and taste and buy!